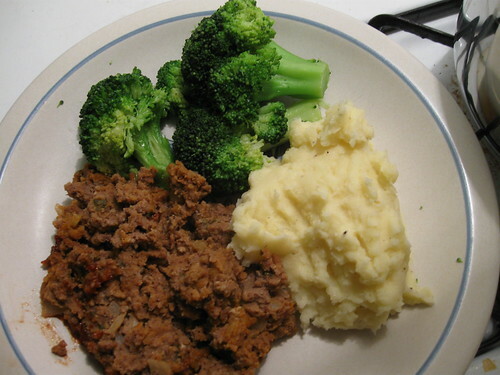 Ok, so it kinda looks like I ate dog food for dinner, with a side of broccoli and mashed potatoes. I swear I didn't. Friday night on my way home from work I stopped in at Borders in search of a specific cookbook that I'd been looking at online. I found the one I was looking for but after thumbing through it at the store, I decided it wasn't exactly what I wanted. I headed over to the gluten-free section to see if there was anything over there. That's where I found it, I had forgotten about it, but it's exactly what I needed... Carol Fenster's 1,000 Gluten-Free Recipes cookbook. I took a quick look through it, but right away, I knew I needed to add this to my library. I absolutely love it. She really has given us the "encyclopedia of gluten-free recipes" in this book. This is the perfect thing to help me with my meal planning issues. It is packed full of delicious and easy recipes. I already had a pound of ground beef in the fridge so I looked up ground beef in the index and went straight to her meatloaf recipe. The meatloaf that I grew up with was very basic, meat, breadcrumbs, egg, salt, pepper... I don't even know if it had ketchup in it. She also had a recipe that was made with stove top stuffing... soooo delicious. This recipe calls for tomato sauce and onions so I knew it would be different, but I love to try new things. Unfortunately my brain was mush today and I forgot a few things when I went to the grocery store, so I improvised a little. It called for tomato sauce, which you add brown sugar, worcestershire sauce and seasonings to, but I forgot it so I used ketchup instead. I know ketchup already has sugar in it but I went ahead and added the other ingredients as if I had used tomato sauce. I thought it tasted pretty good. I used Shabtai Gourmet GF Preadcrumbs, but next time I'd use something else. I was at Good Health today and had the Gillian's GF Bread Crumbs in my hands but I put them down and forgot to go back and get them. I picked up a Namaste Foods muffin mix though, I'm making that next. You just reminded me that I need to review that book! The publishers of it sent me a copy in the Fall and I totally forgot to review it. Whoops. Anyway, it is a great book and I'm glad the meatloaf was tasty! I made an apricot chicken dish from it recently that was amazing. Looks yummy!! Oh mashed potatoes, how I wish your starches didn't turn into sugar!! :) Your post cracked me up! By the way, I LOVE this cookbook too... The pizza crust recipe is excellent - just made it last night (again).